Station Workshop EME Roorkee Recruitment 2017 – 09 MTS, Tradesman Mate & Other Posts :- Station Workshop EME Roorkee, Haridwar (Uttarakhand) has issued notification for the recruitment of 09 posts of Cook, Dhobi, LDC, MTS (Safaiwala /Chowkidar) & Tradesman Mate. Interested & eligible candidates can apply in prescribed application format within 21 days from the date of publication of advertisement in the Employment News. Age Limit : 18 to 25 years as on last date of submission of application form. Necessary age relaxation as per exciting Government order for SC/ST/OBC/PH/ESM is applicable. For Cook, Dhobi, LDC, MTS (Safaiwala /Chowkidar) : Matriculation pass or equivalent from recognized Board. For Tradesman Mate : Matriculation pass or equivalent from recognized Board. OR Certificate from a recognized Industrial Training Institute or Armed Forces Personnel or Ex servicemen in possession of matriculation or equivalent certificate. Date of Publication in Employment News : 15/07/2017 to 21/07/2017. Last Date to Submit Application Form : Within 21 days from the date of advertisement. How to Apply: Interested eligible candidates can send their application in prescribed format along with all necessary documents to Officer Commanding, Station Workshop EME, Roorkee – 247667, District – Haridwar (Uttrakhand) by Ordinary post within 21 days from the date of publication of advertisement in the Employment News. 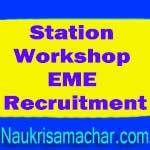 Subscribe our Free Job Alert Mail Service for Latest Station Workshop EME Recruitment Notification.